Optimize your Visual Basic and VBA code. Understand and document existing projects. Browse code as hypertext and call trees. Remove dead code to write smaller and faster programs. 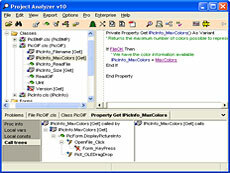 Project Analyzer is a complete source code analysis tool for Visual Basic developers. Detect dead code. Remove unused modules, procedures, variables, constants and controls. Decrease your .exe by up to 100s of kB. Standardize naming. Enforce naming conventions on variables, procedures and other objects. Pro, Ent. Find duplicate blocks. Spot and join duplicate code blocks that frequently result from copy & paste coding. Ent. Ensure .NET compatibility. Review VB6 code for known VB.NET compatibility issues. Ent. Document your projects. Generate comprehensive documentation with reports such as procedure list, variable list, control list, interface list and project dictionary. Print your source code in multiple columns with syntax highlighting. Export code as syntax highlighted RTF or HTML. Create code manuals and source code web sites. Pro, Ent. DLL and COM analysis. Analyze the contents and use of binary .dll, .ocx and .exe files in VB code. Ent. Metrics. Monitor code quality with 180 metrics, such as lines of code, cyclomatic complexity, relative complexity, depth of nesting, comment density, length of names and object-oriented metrics. Compare projects and view project history. Ent.